Freedom comes from courageously stepping into the unknown. live your life on your terms? It starts here. SoulTribe Adventures are yoga, fitness & adventure retreats that ignite positive shifts in your life. that challenge your body and mind and reconnect you to your power. and need a meaningful getaway to get clear on how to move forward, we invite you to read on and dive in. Ready for an experience that is not your typical yoga retreat? Imagine… spending a week in a stunning location - waking up to the sounds of the waves lapping up on the sand or to birds and jungle creatures letting you know the sun has risen and it’s time to take on the day with confidence. Imagine… a Tribe of people who gets you, supports you through every challenge and brings a new meaning to the word FUN! 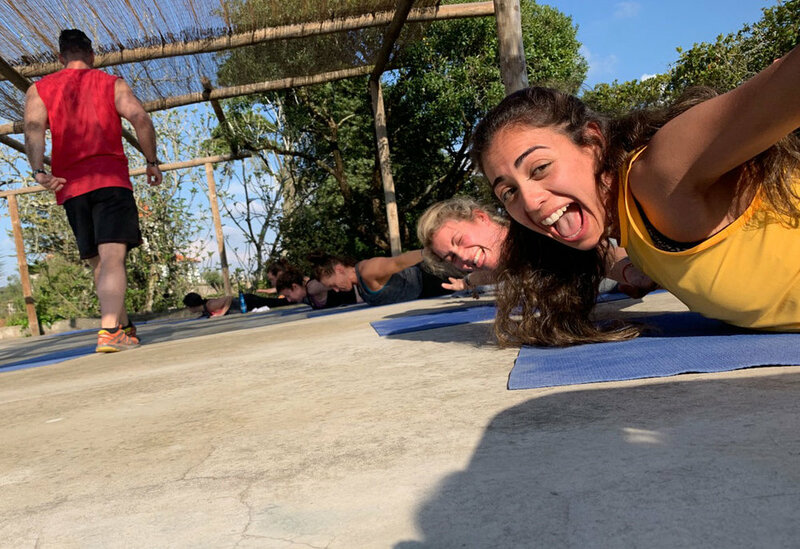 Imagine…Yoga classes, workouts, thrilling outdoor adventures, workshops and group discussions curated to lead you out of your comfort zone, encourage you to face fears and look at how you show up to new and exciting challenges. Imagine yourself post-retreat, coming home glowing, empowered and bursting with renewed excitement for what’s to come. Yaaaaas! Put down the phone & reconnect mentally, spiritually & physically. Join a tribe that celebrates your uniqueness, lifts you up and encourages you to be you and do you, but also be your best. You deserve to live life in a way that lights you up, but happiness is an inside job. 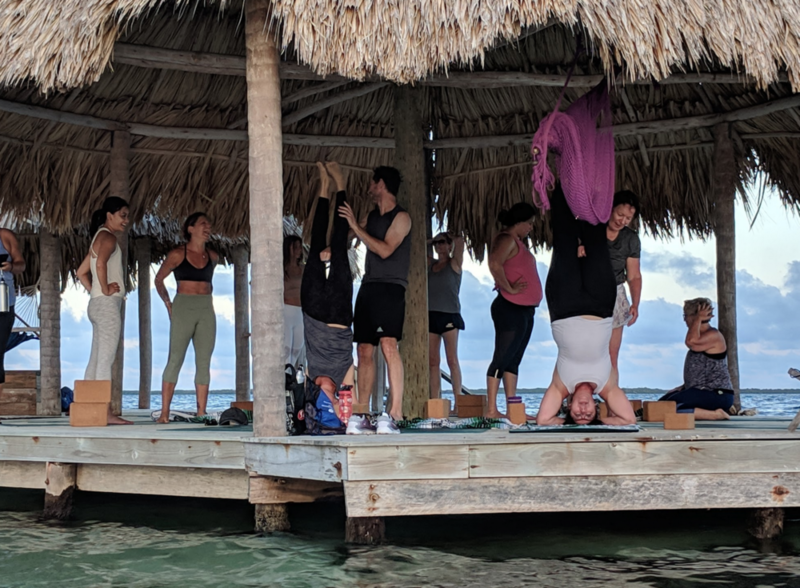 Joining a SoulTribe Adventure will quickly make you feel like you’re part of a big family: definitely not silent, joyfully interactive and usually hilarious! We work hard, play hard and rest hard. We start to break through patterns that have kept us from our full potential all while building real friendships for life. You’ll learn what it means to show up for yourself and for others, what it means to dig deep, and get closer to the inner confidence you find when you slow down and listen to your gut, for real. Most importantly, you’ll come home transformed in some way. Feel stronger, clearer and more connected to YOU. Movement and play are a big part of our programs. Dropping the hats we wear and feeling like kids again brings us back to who we truly are and gives us a chance to look at life with a fresh perspective. 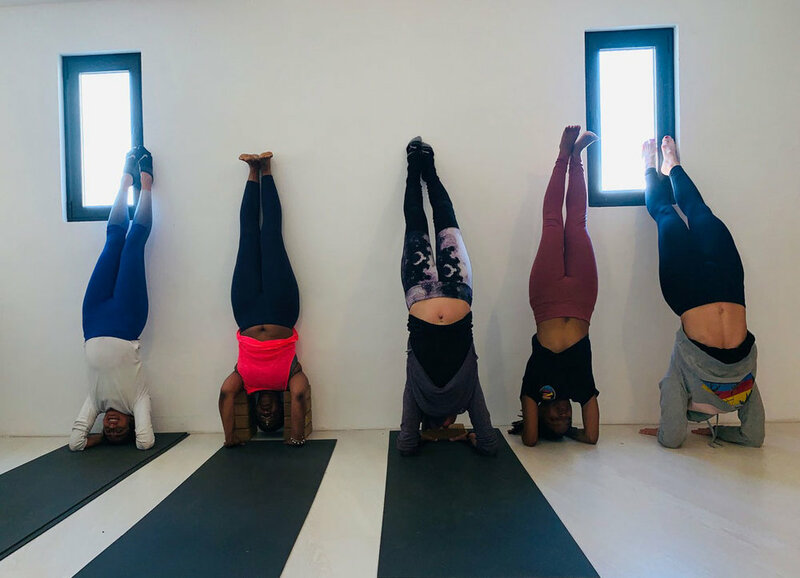 Our daily yoga & fitness classes are accessible and challenging for all, and designed to remind you that you can do anything you set your mind to - especially if you approach it with a sense of humor. You don't need to be a yogi or a fitness buff - you just need to be a human being interested in exploring, playing, growing and getting your movement on! If you’d like to dabble in the world of mindfulness and meditation without being too serious about it, or want to learn to stand on your hands or on your head, we've got you there too! Reclaim your power with adventures that make you feel alive. Fear and stagnation can make us feel paralyzed in life. The best cure for inaction and fear of moving forward is to put ourselves in uncomfortable situations and learn to be ok with the discomfort. Life will throw us curve balls and crappy circumstances; it’s how we react to those situations that determines our inner peace. From cave drops of 300ft in Belize to zip lining in Mexico, to cliff-jumping into crystal clear waters in Portugal or hiking to the top of a volcano in the middle of the night in Bali, our adventures are made meet you where you are and help you break through your own mental blocks and self-imposed limits! You can do ANYTHING when you believe in yourself! This is your time. You do you. If you’re like us, you spend a lot of your time doing things for other people, meeting deadlines, being places and feeling like you have little choice in the matter. Well, not here! Retreat days are structured with an array of activities to choose from and complete freedom to do the things that make your soul play. We offer a Vinyasa Yoga class every morning, a daily Metabolic Effect workout class (30 minute HIIT workouts at your own pace), and we wind down with restorative yoga and guided meditations. In between, there's down time and group time including discussions, arm balance & inversion workshops to help you learn to get upside down(! ), hikes, scrumptious meals and epic outdoor adventures. Not feeling it that day? Get a massage, nap in a hammock or have a cocktail by the pool. Excited and a little nervous to do something like this? Good! That’s exactly how we hope you’ll feel. Walking into the fire is never easy, but it’s always worth it. From places of fear and excitement, magic happens! People return to us year after year because there's nothing like the feeling of being part of something, especially something that's designed to help you be a better you. Sharing time with like-minded people, being active, pushing limits, supporting each other and making real connections is powerful. 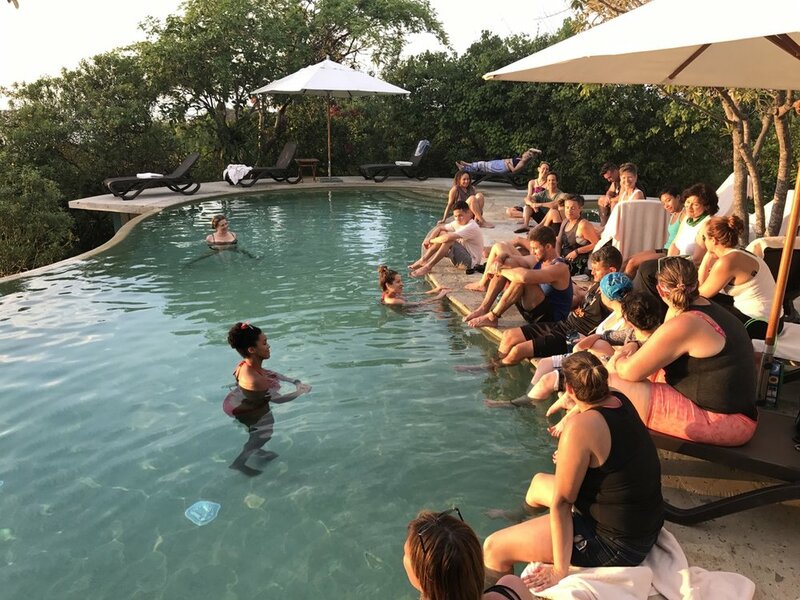 We love to bring people together and create moments that promote love and growth, and we are committed to providing you with a truly exceptional retreat experience. All you need to do is show up, be yourself, and be ready to play! "Thank you for being so amazing. Don't change a thing about yourselves. I loved that you weren't "yoga travel experts" per se. I felt like we were ALL on a journey together figuring out how to make a magical experience. It was organic and real. Nat, you are such a force of nature. Trust your instincts; they are divine!" "This experience completely changed my life. I was physically and emotionally rejuvenated in a priceless way." "This experience was completely transformative to the well being on my soul. The connections that were made with 35 strangers from all over the United states and Canada were authentic and absent of ego. We became a family almost instantly! I felt comfortable and supported and encouraged to be my true self. I am forever grateful for Nathania, Paul and Monica because they had a vision and held their vision into its fruition. Thank you all for having the courage to dream big! I will travel anywhere to be apart of such a beautiful and brilliant team. Thank you." "Overall I had a great trip. If I went again I may go by myself or just one other person. Well organized and a great location. Thank you for hosting." "Best thing I've done in my life." 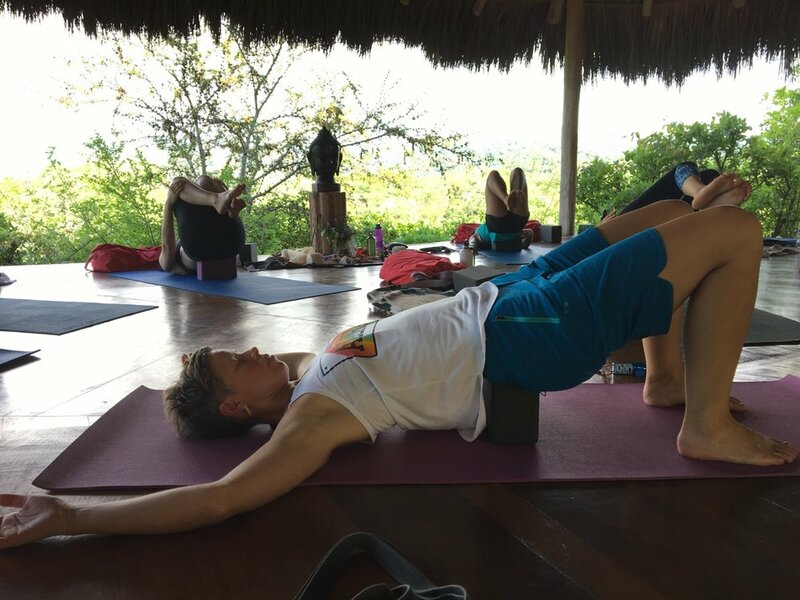 "Nathania you are such a wonderful person and a great Yoga retreat planner! I really appreciate all the time and energy spent to arrange such a wonderful week in a spectacular setting. The addition of fitness (and Gary) is the perfect compliment to any yoga practice. I can’t wait until the next adventure!" 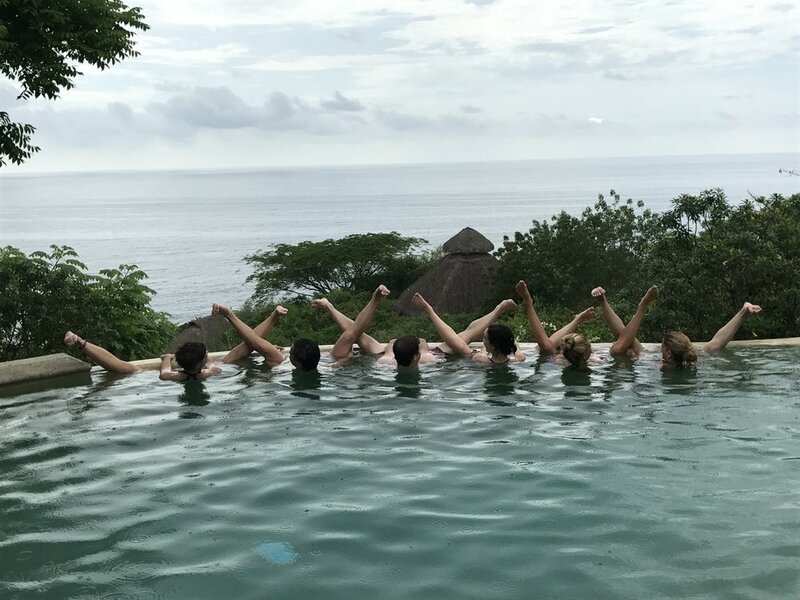 Leading retreats combines all of my favorite things: travel, yoga/fitness, adventure, and helping you realize you're capable, strong and worthy of creating anything you want in life. This thing's too short to spend it waiting for something to change. Let's explore the possibilities, play like kids and absorb the power of community. You're a part of the tribe already, we're waiting for you. If I'm being honest this is what I've always wanted to do. It just took me way too long to figure it out! I love seeing the little lightbulb go on for people when they get a concept or that "Aha" moment when they realize that "Yes, you can" actually do that thing, whatever it is. Whether it's jumping off of a platform with a rope tied to your waist or helping someone find a way to see something from a different perspective and have a breakthrough this is my fire. Are you ready? Join the Tribe!